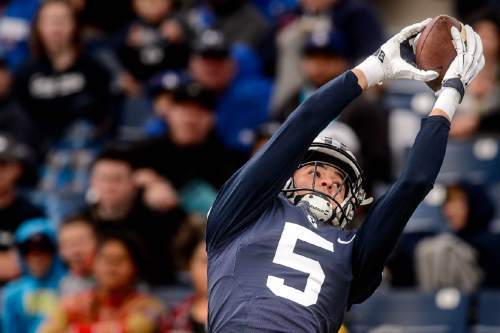 Trent Nelson | The Salt Lake Tribune BYU's Nick Kurtz pulls in a pass during BYU's Blue and White spring football game in Provo, Saturday March 26, 2016. 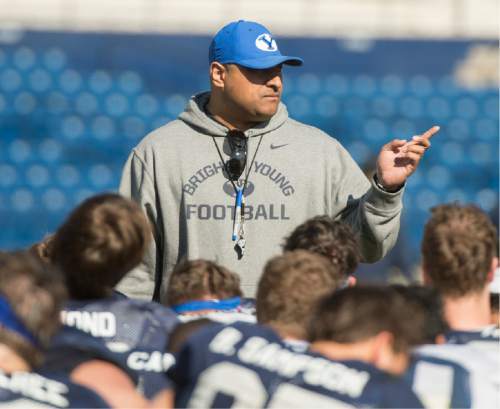 Rick Egan | The Salt Lake Tribune BYU head football coach Kalani Sitake takes to his team after BYU's final practice of spring camp, at LaVell Edwards Stadium, Friday, April 1, 2016. Rick Egan | The Salt Lake Tribune Brigham Young Cougars quarterback Tanner Mangum (12) looks for an open man, in college football action, BYU vs. Boise State at Lavell Edwards Stadium, Friday, August 21, 2015. Rick Egan | The Salt Lake Tribune BYU Defensive Coordinator & Linebackers Coach, Ilaisa Tuiaki, answers questions from the press, during the annual football media day at the Broadcasting Building,Thursday, June 30, 2016. 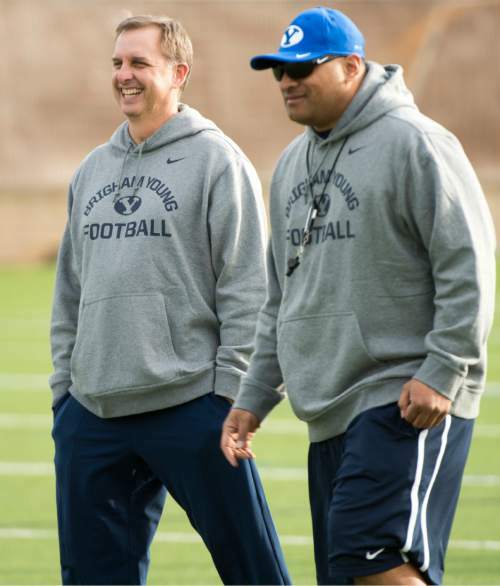 Rick Egan | The Salt Lake Tribune BYU quarterback coach Ty Detmer and head coach Kalani Sitake share a laugh with on the second day of spring practice, in Provo, Thursday, March 3, 2016. 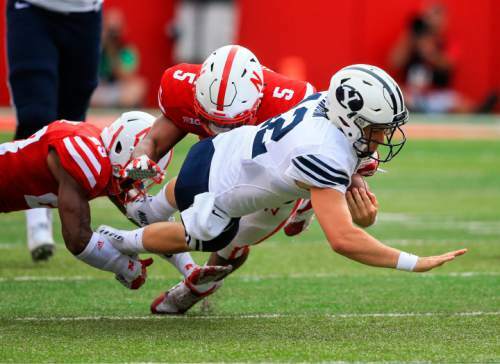 BYU quarterback Tanner Mangum (12) is tackled by Nebraska linebacker Dedrick Young (5) and cornerback Daniel Davie, left, during the first half of an NCAA college football game in Lincoln, Neb., Saturday, Sept. 5, 2015. (AP Photo/Nati Harnik) Trent Nelson | The Salt Lake Tribune Brigham Young Cougars quarterback Tanner Mangum (12) throws the ball as Utah faces BYU in the Royal Purple Las Vegas Bowl, NCAA football at Sam Boyd Stadium in Las Vegas, Saturday December 19, 2015. Trent Nelson | The Salt Lake Tribune BYU quarterback Tanner Mangum hands off to Squally Canada during BYU's Blue and White spring football game in Provo, Saturday March 26, 2016. 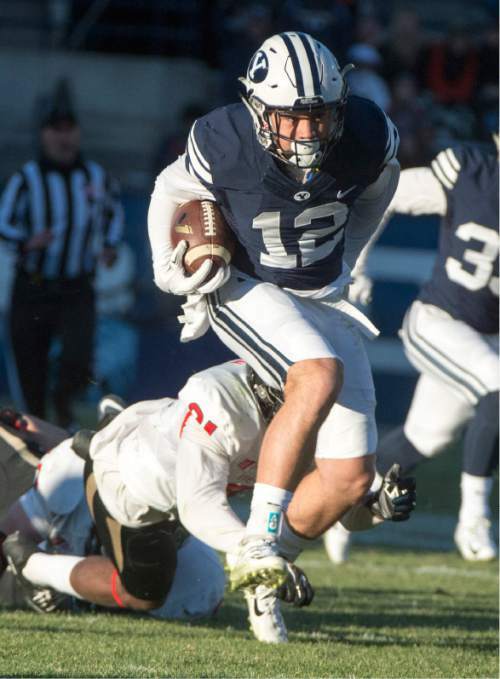 Rick Egan | The Salt Lake Tribune Brigham Young defensive back Kai Nacua (12) celebrates after making a key interception in the 4th quarter for the Cougars, in college football action, BYU vs. Boise State at Lavell Edwards Stadium, Saturday, September 12, 2015. Rick Egan | The Salt Lake Tribune Brigham Young Cougars defensive back Kai Nacua (12) is brought down by Fresno State Bulldogs offensive lineman Justin Northern (54), after intercepting a Bullldog pass, as BYU defeated the The Fresno Bulldogs 52 -10, at Lavell Edwards stadium, Tuesday, November 21, 2015. Trent Nelson | The Salt Lake Tribune Brigham Young Cougars running back Jamaal Williams (21) runs the ball in the second quarter as the BYU Cougars host the Utah Utes, college football Saturday, September 21, 2013 at LaVell Edwards Stadium in Provo. 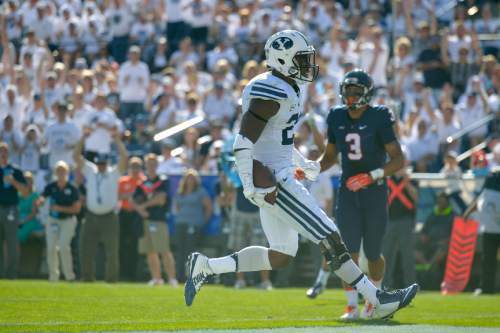 Chris Detrick | The Salt Lake Tribune Brigham Young Cougars running back Jamaal Williams (21) celebrates his touchdown run during the second half of the game at LaVell Edwards Stadium Saturday September 20, 2014. BYU won the game 41-33. 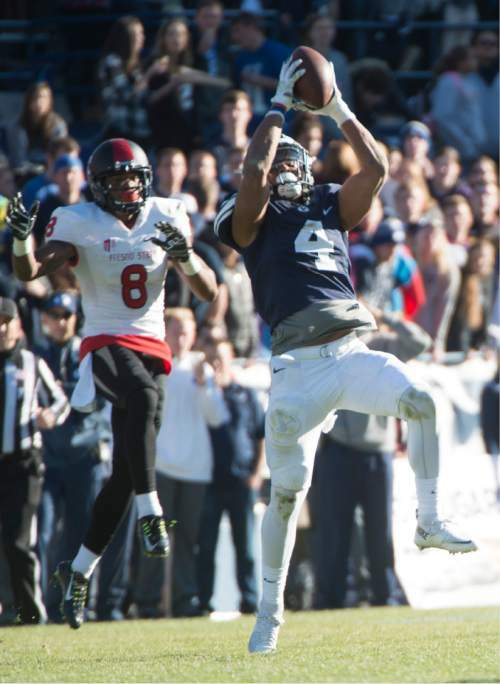 Rick Egan | The Salt Lake Tribune Brigham Young Cougars linebacker Fred Warner (4) intercepts a pass intended for Fresno State Bulldogs wide receiver Da'Mari Scott (8), in football action, BYU vs. The Fresno Bulldogs, Tuesday, November 21, 2015. BYU linebacker Fred Warner (4) defends San Jose State running back Tyler Ervin (7) during the first half of an NCAA college football game Friday, Nov. 6, 2015, in San Jose, Calif. (AP Photo/Marcio Jose Sanchez) Rick Egan | The Salt Lake Tribune Brigham Young Cougars defensive back Kai Nacua (12) runs with the ball, after intercepting a Fresno State Bulldogs pass, as BYU defeated the Fresno Bulldogs 52 -10, at Lavell Edwards stadium, Tuesday, November 21, 2015. Provo • Kalani Sitake wouldn&apos;t bite. At BYU&apos;s football media day in June, the first-year head coach was asked what would have to happen for his inaugural season to be considered a success. "Are you looking for me to say how many wins?" Sitake asked back. "Because I am not going to do that. I am not going into it with a limit. If you ask any coach right now, nobody is planning on losing any games." Tell that to a fan base that is hungry for more success than 11-year coach Bronco Mendenhall was able to deliver, as crazy as that may sound about a man who posted 99 victories before heading off to Virginia for a bigger paycheck and lower expectations. Even BYU&apos;s athletic director, Tom Holmoe, is adding to the hype, telling an Education Week audience last week, "there is new hope. It is the dawning of a new day." Offensive coordinator Ty Detmer says he can feel the excitement and optimism everywhere he goes, and almost always finds himself tempering expectations with that measured, Texas drawl. "We haven&apos;t won any games yet," the former Heisman Trophy winner reminds anyone who will listen. Nor lost any. Recognizing that, Siitake said in June that the honeymoon period is already over, that it was well past time to get down to business. "I don&apos;t think it is anything I&apos;ve done, to bring the excitement," said the former University of Utah and Oregon State defensive coordinator. "To be honest with you, there is always excitement in football. .. Coach Mendenhall did a great job when he was here with the program. We have a lot of guys coming back, really great talent coming back, and I think they are looking forward to getting on the field." Certainly, this has the potential to be one of the most talented groups at BYU in the past decade. Trouble is, that might not be reflected in the won-loss record, because the schedule is loaded with Power Five teams. 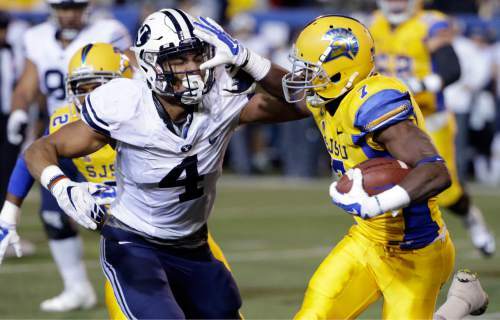 The Cougars will likely be underdogs in seven of their first eight games. 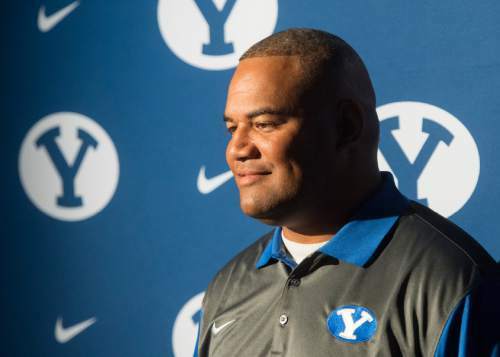 "It doesn&apos;t scare me," Sitake said of the gantlet that begins Sept. 3 against Arizona. "We won&apos;t have to worry about getting our guys up for the games, even though that really wasn&apos;t an issue in the past. Walking into these stadiums and seeing these teams that have a lot of tradition, like we do, is going to be a lot of fun." 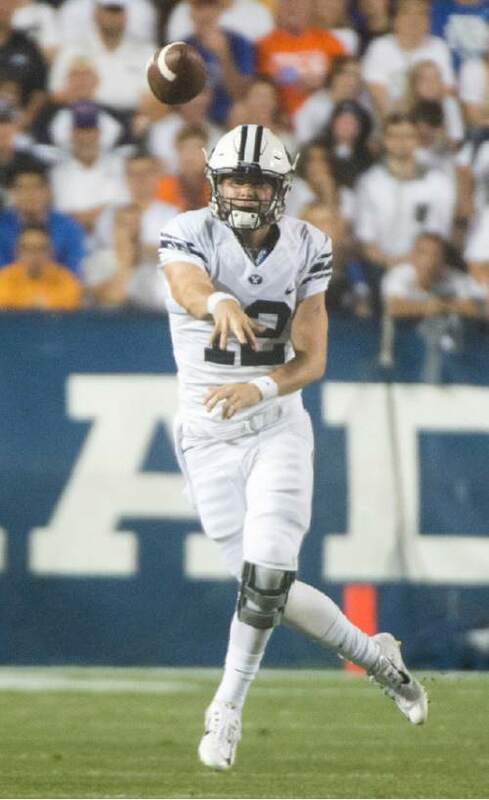 Offensively, Detmer inherited an experienced quarterback  senior Taysom Hill was named the starter this past week, with the seasoned Tanner Mangum behind him  and one of the most prolific running backs in school history, senior Jamaal Williams. They are a bit thin and inexperienced at receiver  especially if senior Nick Kurtz can&apos;t answer the opening bell after fracturing his foot in June An offensive line that was supposed to be solid looks less that way now due to lingering injuries and suspensions. BYU is moving to a 4-3 defensive alignment up front, and will ask its corners to play more man-press and less zone than in the past. Nose tackle Travis Tuiloma, linebacker Fred Warner and safety Kai Nacua will give the defense some teeth, provided Tuiloma makes it back from a Lisfranc foot injury and Nacua from double shoulder surgery. It could be a long season in the kicking department. One of two freshman walk-ons, or perhaps a kicker who won&apos;t join the team until school starts next week, will get the job. Their definition of success does not include anything close to 12 wins. The goal against this schedule should be to make a 12th-straight bowl appearance. 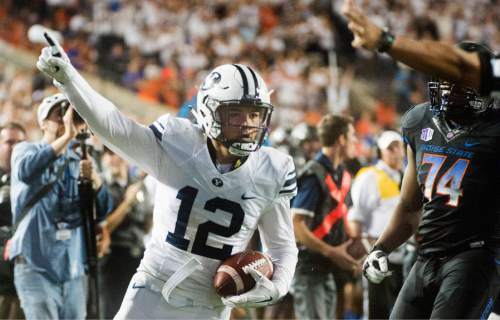 Probable underdogs in seven of their first eight games, and with a new coaching staff, six or seven wins is a realistic expectation in the first season for Kalani Sitake, right. Anything more is icing on the cake. 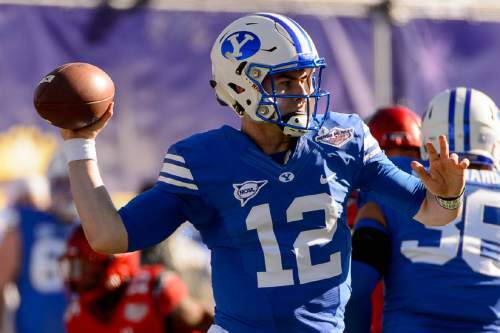 They become overwhelmed by a Power Five-type schedule and succumb to all the lofty expectations that have accompanied Sitake and new offensive coordinator Ty Detmer into Provo. There will be growing pains for both those guys, as well as new defensive coordinator Ilaisa Tuiaki, right. Perseverance will be key when the honeymoon period ends. Talent-wise, this looks like one of the better BYU teams of the past six years, but on-field results might not show. 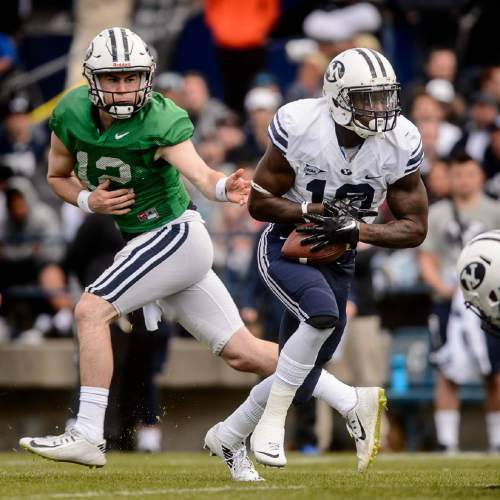 If the offensive line comes along and gives quarterbacks Taysom Hill and Tanner Mangum, left, time to do their thing, and gives Jamaal Williams holes to run through, the Cougars could spring some upsets because the defense looks solid and capable of keeping games close. Sept. 3 vs. Arizona at Glendale, Ariz., 8:30 p.m. • Good thing this is indoors, because it&apos;ll be above 90 outdoors. 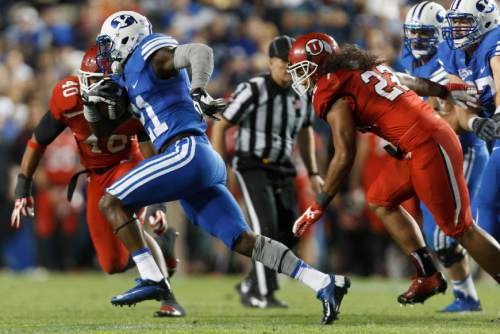 Sept. 10 at Utah, 5:30 p.m. • Storylines abound as Cougars visit Rice-Eccles for first time since 24-21 loss in 2012. Sept. 17 vs. UCLA, 8:15 p.m. • Can BYU sell out LaVell Edwards Stadium for home opener vs. a big-time opponent? Sept. 24 vs. West Virginia at Landover, Md., TBA • First-ever matchup with Mountaineers carries Big 12 intrigue. Sept. 30 vs. Toledo, 8:15 p.m. • Will Cougs be looking for first win in this Friday night special? Oct. 8 at Michigan State, TBA • Huge task in East Lansing for BYU; Sparty ranked No. 12 in AP preseason Top 25. Oct. 14 vs. Mississippi State, 8:15 p.m. • Rare visit to Provo for an SEC team; Cougars return the trip in 2017. Oct. 20 at Boise State, 8:15 p.m. • Broncos will be bucking for revenge after 2015 last-second BYU win. Nov. 5 at Cincinnati, TBA • At least one, or both, of these teams could be headed for the Big 12 in 2017. Nov. 12 vs. Southern Utah, 1 p.m. • BYU assistant Ed Lamb faces his former team as T-Birds make first visit to BYU. Nov. 19 vs. UMass, TBA • A November matchup of independents in Provo, but not the one the Cougars wanted. 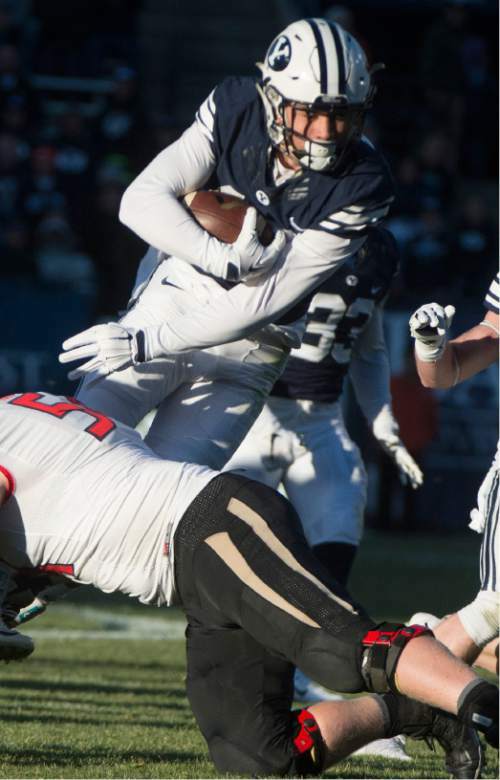 Nov. 26 vs. Utah State, TBA • BYU took back the Old Wagon Wheel with a 51-28 romp last year in Logan.